L’Islam contemporaneo. Sfide e Riflessioni tra modernità e modernismo (Islam in the contemporary. Challenges and reflections between modernity and modernism). Torino: Anankelab, 2016. Etica Islamica. Ragione e Responsabilità (Islamic Ethics. Reason and Responsibility), Torino:Edizioni Paoline, 2016. The Struggle to Define a Nation. Rethinking Religious Nationalism in the Contemporary Islamic World, Piscataway NJ: Gorgias Press, 2016. Edited with Dr. Paolo Maggiolini. Storia dei Popoli Arabi. Dal Profeta Muhammad alle Primavere del Vicino Oriente, (History of the Arab Peoples. From the Prophet Muhammad to the “Arab Springs”), Ananke editore, Torino, 2013. Paolo Branca, Marco Demichelis, Memorie con-divise. Popoli, Stati e Nazioni nel Mediterraneo e nel Medio-Oriente (Shared memories. Peoples, States and Nations in the Mediterranean and Middle East), Leggere Leggere editore, Milano, 2013. Il pensiero mu‘tazilita. Ragione e fede tra Basra e Baghdad nei primi secoli dell’Islam, (The mu‘tazilite thought. Reason and Faith between Basra and Baghdad in Early Islamic History), Harmattan, Turin 2011. The Oromo and the historical process of Islamization in Ethiopia: Habashah vs. Argobba on the “Acrocoro, in A.C.S. Peacock Ed. Islamisation: Comparative Perspectives from History, Edinburgh: Edinburgh University Press, (2017). The Other in the Qur’ān. The Khātim an-Nabiyyīn (The Seal of Prophets) and its inclusive-exclusive proclivity, Journal of Values and Beliefs, Routledge, 2016. Fanā’ al-Nār within early Kalām and Mysticism. An analysis between VIII and IX centuries, in Archiv Orientalni, the Oriental Institute of Praha, 2015. Il Califfato Islamico. Propaganda e sostanza all’origine dell’ISIS (The Islamic Caliphate. Propaganda in substance at the origin of Daesh), in Il Tablet e la Mezzaluna. Islam e Media ai tempi del meticciato, Venice. Marsilio Editore, 2016, pp. 44-53. 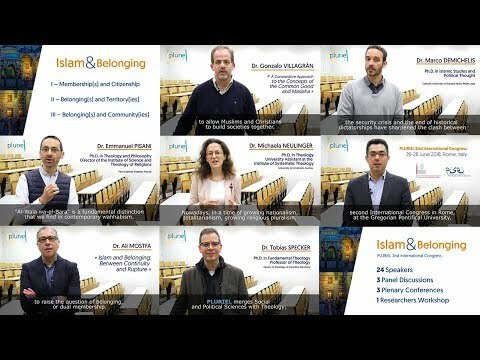 Islamizzare la Secolarizzazione per laicizzare l’Islam (Islamize Secularization to secularize Islam), in Troppa Religione o Troppo poca? : Cristiani e Musulmani alla prova della Secolarizzazione, Venice: Marsilio Editore, 2015, pp. 25-36. L’Involuzione Wahhabita. Dalle Origini al Neo-Salafismo (The Wahhabi involution. From the Origins to the Neo-Salafism), in La Galassia Fondamentalista tra Jihad Armato e Partecipazione Politica, Venice: Marsilio Editore, 2015, pp. 83-94. Kalām viewpoints present within the debate on secularisation between F. Anṭūn and M. ‘Abduh. God’s absolutism and Islām’s irrationality as cornerstones of Orientalist Arab-Christian thought during the Nahḍa, in Aram, 25 1&2, 2016, Peeters Publishing, pp. 335-348. The Apocatastasis will save us all. The transition towards a shared ethical approach from Christian Patristic to Early Islamic theology and philosophy, in Parole de l’Orient, Saint Joseph University, n.1/ 2014, pp. 385-422. Kharijites and Qarmatians; the Islamic pre- democratic thought. A political-theological analysis, in Religions and Representation: Islam and Democracy ed. by Ingrid Mattson, Paul Nesbitt Larking and Nawaz Tahir, Cambridge Publishing Press, 2015, p. 101-127. Islamic Liberation Theology, An inter-religious reflection between Gustavo Gutierrez, Farid Esack and Hamid Dabashi, Oriente Moderno, 94 (2014), pp. 125-147. The Ethiopian studies in Italy, between afro- Orientalism and colonialism, in: Italian Orientalism, Antares, Alba, 2011, pp. 90- 107. Sayyid Qutb, the theorist of Political Islam. The long road to Islamic radicalism, al-Hiwar, 4/2011 (monographic work on the Muslim Brotherhood), pp. 23-32. Basra, the cradle of Islamic culture. A reasoned analysis of the urban area that was the early home of Islamic Studies, as conference proceedings: Le vie del sapere nell’area siro-mesopotamica tra III e IX secolo, Roma, 12-13 may 2011, on Orientalia Christiana Analecta, n. 293, 2013, pp. 191-220. Between mu‘tazilism and syncretism: a reappraisal of the behaviour of the caliphate of al-Ma’mun, Journal of Near Eastern Studies (JNES), University of Chicago, 2/2012, pp. 257-273. New-Mu‘tazilite theology in the contemporary age. The relationship between Reason, History and Tradition, Oriente Moderno, Nallino Centre for Middle Eastern Studies, Rome, 2/2010, pp. 411- 426. The Mihna. The violence of the political language and the exhibition of death. The image of anhistorical event perceived as paradigmatic, Archivio Teologico Torinese, Turin, Italy (Journal of the Faculty of Theology, University of Turin), Vol. I, 2010, pp. 170- 187. Consensus and equality within Arab-Islamic thought of the VII-VIII century CE, in Freedom and Democracy in the History of Political Thought, Rubettino Università ed., Catanzaro, 2008, pp. 197- 205. Il razionalismo islamico, la scuola mu‘tazilita, tra Corano creato e lotta al determinismo divino,Archivio Teologico Torinese, (Journal of the Faculty of Theology, University of Turin), entitled: (Islamic Rationalism:, the Muʿtazila school, between created Koran and the struggle on divine determinism) Vol. II, 2008, pp. 453- 469. The relation between Faith and Reason, a Christian and Islamic parallelism, Quaderno 4, Balducci Foundation, Florence, Italy, 2007, pp. 101- 117. Fana’ al-Nar Within Early Kalam and Mysticism. An Analysis Covering the Eighth and Ninth Centuries. The historical debate on secularisation between F. Antun and M. Abduh. 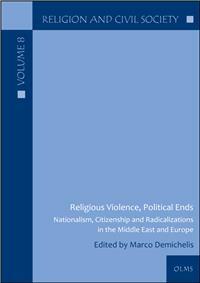 Religious Violence, Political Ends, Olms - Weidmann, 2018, 196, p.
Salvation and Hell in Classical Islamic Thought., Bloomsbury Academic, 2019, 240, p.